Wexford Mercy School Chess Club | Making chess fun! Thanks to everyone who came to the our first chess session of the year. The focus this week was twofold: (1) easing the more experienced, but ever so rusty, players back into the groove and (2) helping the newbies to grasp the basics. I will be relying, to a degree, on the first group to help me with the new recruits. The one big emphasis will be on the importance of looking before you leap! By Easter everyone will have more confidence and competence in their play. The senior classes will work on all aspects of their game – openings, development and end game. My aim is to have them leaving The Mercy this Summer with enough basic knowledge to enjoy a lifetime of chess. It will be a a bit of a juggling act but we will get there. Thanks to Carol for supervising. Man the ramparts, sharpen the swords and ready the horses! Chess sessions at The Mercy recommence on Thursday, January 19. As before we will meet directly after class ends. For this term we are restricting sessions to children from 4th, 5th and 6th classes. We will keep the class size to 20 persons max. We will review this policy at the end of term. Registration: 9.30 to 10.00 a.m.
Prizegiving: Prizes for underage group winners and for best school. All participants receive a medal. General enquiries: Tel 086-8585096. Mercy School enquiries: Tel 053-912 3294. Christmas come and gone and we are into a new year. And, sad to relate, we have gone a whole four months without chess at The Mercy. Why? Garda vetting. It’s a very necessary process but boy does it drag its heels. Anyway, the paperwork is now in order and, all going well, chess recommences this month. I would love for the school to get a tutor in for the older classes. We saw how rapidly everyone improved with last year’s tuition. For now the school says there are no plans to hire the services of an expert. Therefore, we must muddle along as best we can. Back to school means back to chess. Fáilte ar ais to everyone at The Mercy. We had hoped to be starting back next week but rules and regs have thrown up some road-blocks. Matters, as they say, beyond our control. Anyone in a hurry to get back playing chess should head to Wexford Library Wednesday afternoons. The time slot 3.15-4pm is for younger players and those just finding their feet; 4-5pm is for older children/teens. On Tuesday evenings (7pm – 8.50pm) Wexford Library hosts a general meet-and-play session on the top floor. Everyone welcome. The second primary schools chess event of the year takes place at Brandon House Hotel, New Ross this Sat (March 5) at 10.30am. Registration from 10am. Award ceremony at 3.30pm. Every child plays 7 games. Swiss System. No clocks. Fee of €10 includes lunch. 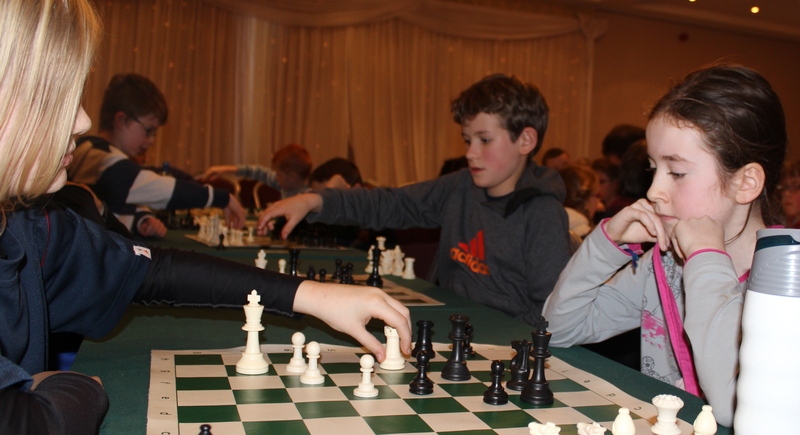 This twice yearly event, organised by Co Wexford Chess, has been growing in popularity in recent years in tandem with the numbers playing chess in our schools. It offers a great opportunity for children of all abilities to meet up with fellow chess players from all over the county. On top of that it is simply a really sociable day out. So, craic first, chess somewhere after that! Further details: Tel Seamus – 086 8585096. Well done to Enniscorthy Chess Club on holding a very successful Chess Congress in Bunclody. Great to see the cream of the country’s chess players in these parts. 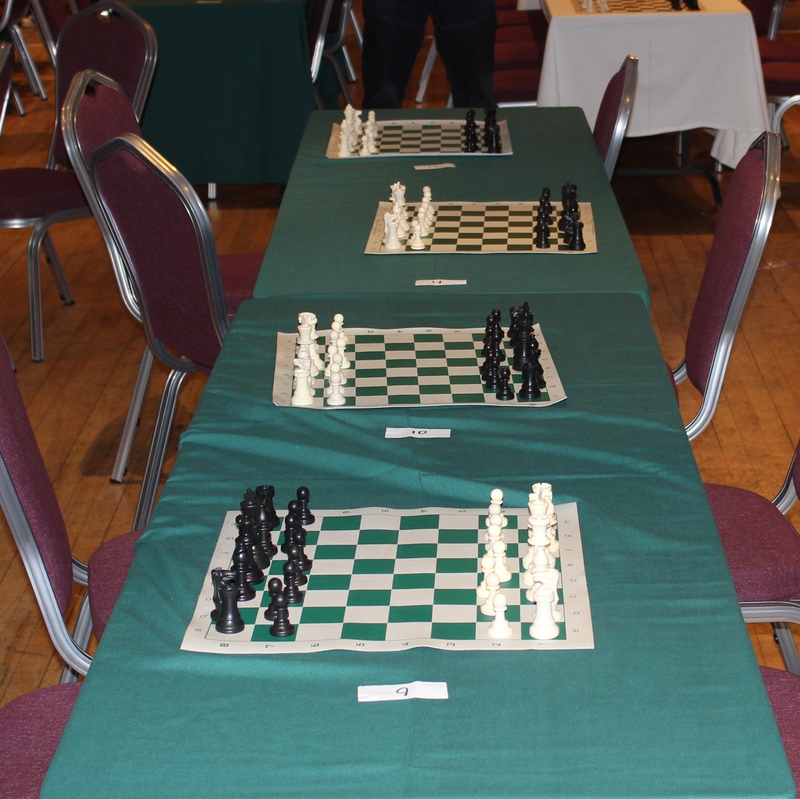 The results are available online: http://www.enniscorthychessclub.com/pairings–results-links.html. Chess Congress to bring Big League Chess to the County! There is a Senior Section 5th / 6th classes and Junior Section – 2nd / 3rd / 4th classes. Teams of 6 (€2 per person). 3 Rounds of chess. Teacher/Responsible adult must accompany each school. Closing date for Entries STRICTLY by 2.30pm Monday 8th February. Email greenbeans3@hotmail.com; Tel 087 9458180; 053 9421178 (mornings only). Competition presented by Eamonn Barrett and Brid Cleary. 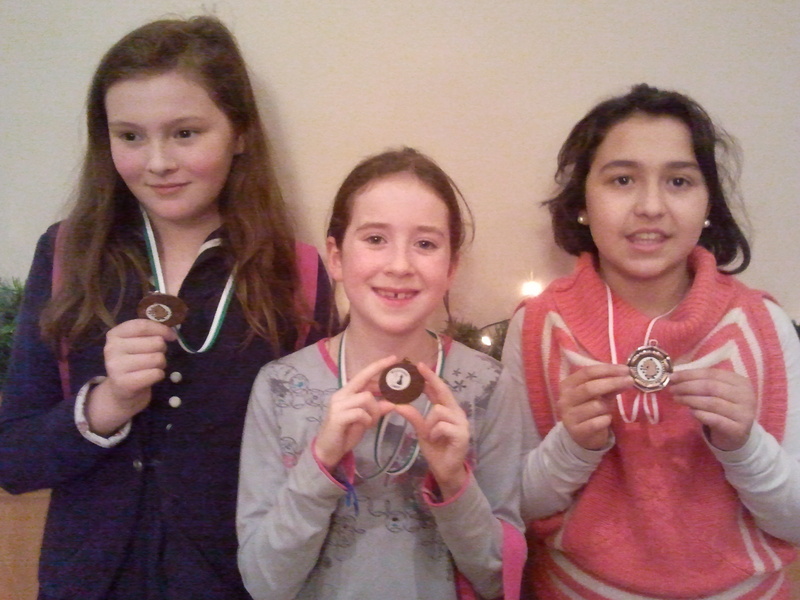 Well done to 5th class girls Patricia Gallagher and Sinéad O’Reilly who competed at the Co Wexford Primary Schools Chess Competition in New Ross on Jan 23. 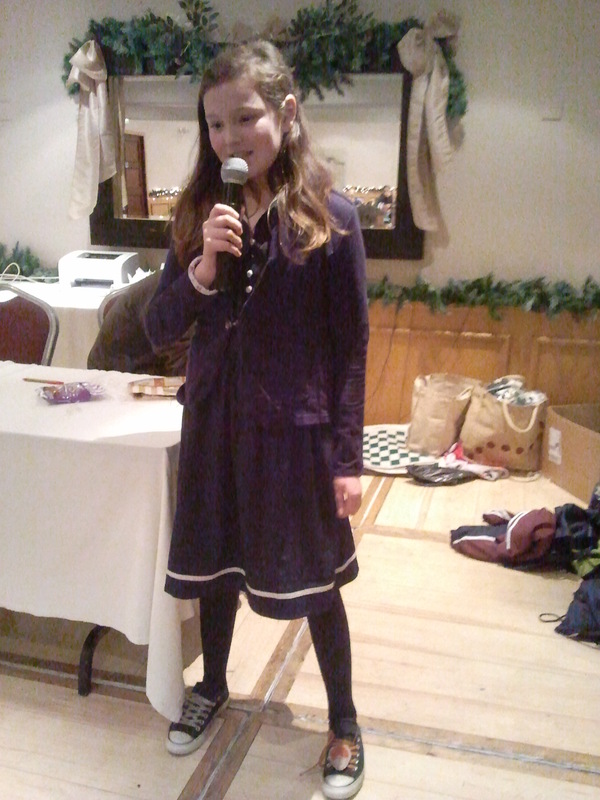 Sinéad came away with 5 out of 7 possible points to place joint third U-12, while Patricia, having come up against some tough opponents, took 2 1/2 points. Well done to both girls. The next competition for primary school children, 24th Annual Wexford Primary School Challenge, takes place at St Joseph’s P.S., Creagh, Gorey on Feb 11. Tel 087 9458180. Details on Facebook. Then on March 5 it’s back to New Ross for the Spring Wexford Primary Schools Chess Competition. For the past couple of weeks chess coach Dovydas Pocevicius has been making a weekly visit to The Mercy (ok, we gave him a break over mid-term!). His mission: to work with a small dedicated group from 5th/6th classes so as to give them a better understanding of the strategic side of the game. And you know what? He is getting on fabulously well with them. He keeps it simple. They listen. They learn. Some serious upskilling going on here! We only learned this week of a chess competition for children taking place this Saturday in the Brandon House Hotel, New Ross. Organised by Chess For All, the competition appears to be similar in format to that organised annually by Wexford Chess at the same venue. There is no competition fee payable thanks to the series (competitions take place at other towns around the country) being sponsored by an “anonymous benefactor”. We have our final get-together this Thursday. With long hot Summer days beckoning it is time to, once again, pack away the boards and take to the great outdoors. So, how has the year gone? I think it is fair to say that our chess sessions have veered towards the recreational rather than the tedious study of openings, strategy and end-game scenarios. That said, we can at least say that everyone now knows their way around a board. More than that: most now stop, think and look before they leap – in any discipline that surely must count as progress! As I said at the start of the school year, playing chess can give young minds something of an advantage when it comes to other subjects. It encourages logical thinking, excellent recall and the looking ahead to possible or likely outcomes. So if you get great end-of-year results you know why! This is the final session for the 6th class girls. We will miss them. Remember to keep playing ladies! See everyone else in September. Scheduled for release July 2015. But will it come to Wexford? At the Mercy we have a very relaxed approach to our chess, maybe a little too relaxed! That being said everyone who comes to the weekly session now has, at the very least, a basic knowledge of the game of chess. This is something which you should be proud to have, something you will have for the rest of your life. Come the Summer holidays there will undoubtedly be the odd rainy day when you are house-bound and find yourself having to make your own entertainment. Now instead of Monopoly, draughts or Snakes & Ladders you can play chess. And even if you are on holidays in France or Spain or Greece, with not a word of the local language, you will find somebody happy to play against you. So HIP-HIP-HORRAY! Well done you. (1) Before making a move, ask yourself why your opponent just moved as he/she did. Once you begin to see what your opponent has in mind you can better plan out your own moves. (2) Keep your mind on the game no matter what. If you are winning you can become complacent and make mistakes. On the other hand if you are behind you can lose heart and hand the game to your opponent on a platter instead of pushing and pushing and exploiting any mistakes he/she might make. Chess Super Grandmaster Wesley So was beaten on Friday by 14-year-old Sam Sevian in the third round of the US Chess Championship. The Filipino So, who now plays for the United States and is ranked eighth overall in the world, suffered the defeat after winning against Samuel Shankland and Daniel Naroditsky in the first two rounds. We are told that So made a blunder with his clock winding down. Sevian, meanwhile, bagged his first victory of the tournament after losing to Varuzhan Akobian and drawing against Gata Kamsky. 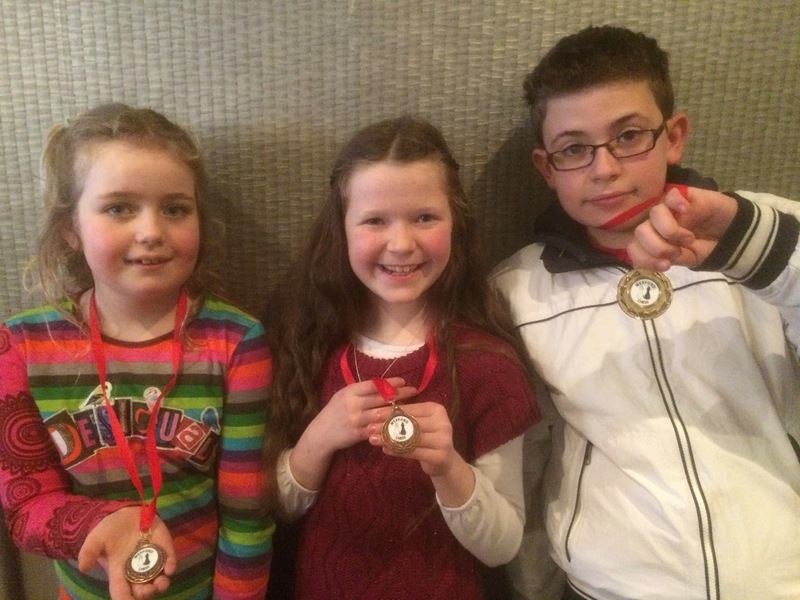 The next chess competition for children in Co Wexford takes place later this month. The 23rd Annual Wexford Primary Schools Chess Challenge happens Thursday, March 26th (6.30-8.30pm) at St Joseph’s Primary School, Creagh, Gorey (near 1798 monument). This has taken over from the annual event formerly hosted by Piercestown National School. There is a Senior Section (5th, 6th classes) and a Junior Section (2nd-4th classes). Teams of 6. €2 pp. Three rounds of chess. 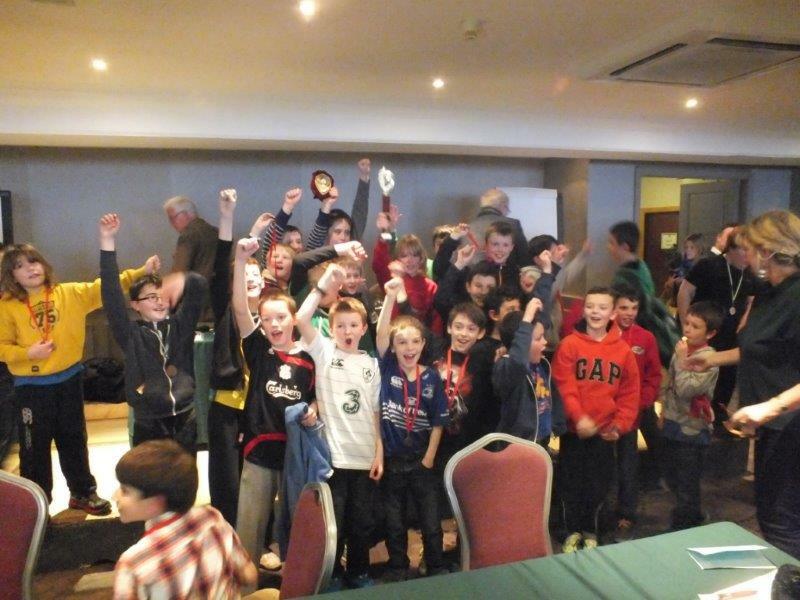 The Co Wexford Spring Chess Competition for Primary Schools took place at the Brandon House Hotel, New Ross on Saturday, February 14. Organiser Seamus Halpenny was delighted with the huge turnout of children from throughout the county. They travelled from Duncannon, Gorey, Rosslare and points in between for this, the first County-level competition of the year. Computer whizz, Eamonn Barrett, ensured that proceedings ran smoothly while event arbiter, Manuel Gardenes, maintained a watchful eye over proceedings. First overall was David Remenyik (St Joseph’s Primary School, Gorey) with Ovidius Saudergas (New Ross) taking silver and Ryan Callaghan (St Joseph’s, Gorey) bronze. The overall Best School Award went to St Joseph’s Primary School, Gorey. Some of the regulars at Wexford Library were in action and all acquitted themselves very well. Lucas Stan, Matthew Molloy and Hugh Boggan won their categories. Matthew McSherry took bronze in his category. Also performing well were Leana Hofmann, Louise Doyle, Darragh Moran and Padraic O’Carroll. Well done to Louise Doyle who participated in her first chess event last weekend, the Spring edition of the Co Wexford Primary Schools Competition. 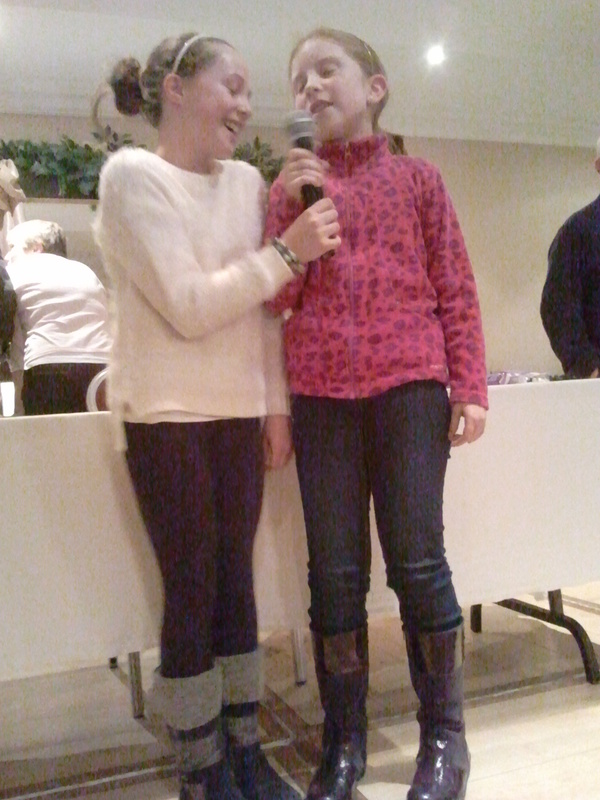 Louise acquitted herself very well and is looking forward to the next competition in Gorey (date to be announced). We got a happy snap of Louise (on left) with friends Leana and Lucas. Enniscorthy Chess Club is surely the most dynamic in County Wexford. They have been creating quite a stir on the provincial and national scene. What is particularly significant is that those creating this stir are underage players and much of their success has been achieved at a senior level. Part of the reason for their success has been top notch coaching. The good news is that they want to share this coaching expertise and, in the process, hopefully attract new members to the club. The past year has been very exciting for our club, we have seen our players win the Mick Germaine Cup, place 3rd in the Bodley League 2013/14, and individuals place in the prize giving of almost all national events we have attended. This season we entered a second team in the Leinster leagues, it is our hope that both teams will be promoted and that we will be able to field a third team next season. Players from our club have also won the following school team titles – Checkmate Primary School Champions, Gaelscoileanna Champions, Wexford Primary Schools Champions and runner up in the Leinster Schools Chess Association League. Chess is proven to develop logical thinking, it promotes imagination and creativity, chess teaches independence it teaches one to be aware of the consequences of ones actions. Chess is proven to improve problem solving skills and improve memory and concentration, it has a positive influence on the development of both numerical and verbal aptitudes, in fact many would say chess is the single most powerful educational tool there is. We at Enniscorthy Chess Club firmly believe this is the case! With this in mind and the anticipation of expanding the club we are delighted to announce that when coaching resumes next week we will be offering three distinct levels of coaching. We believe by dividing the coaching into intermediate and advanced groups and introducing a beginners session that each child will benefit from coaching tailored to their own individual needs. Beginners: 6pm – 7pm. Beginners will be introduced to the game of chess by our own up and coming coach Dovydas Pocevicius and prepared for the intermediate class if desired. At the same time players from the advanced group will be on hand to share their knowledge on an individual basis. This will afford beginners the opportunity to learn from the coaching and from the experience of our advanced players. Intermediate: 6pm – 7pm. Intermediate coaching is designed for unrated players or those with an ICU (Irish Chess Union) rating of less than 1000, who have shown a strong understanding of the game. Advanced: 7pm – 8pm. Advanced coaching is designed for players with an ICU rating in excess of 1000. Play Time: 7pm – 8.30pm. After coaching, players from both beginners and intermediate will be encouraged to practise their skills with fellow club members. They will be joined from 8pm by the advanced players. Children not attending coaching along with adults are welcome to join in; a €3 fee per night applies in such case. Players who do not wish to attend coaching may also avail of a full term play pass for €20. The cost of coaching sessions is as follows: Intermediate/Advanced €70 per child, there will be a 10% family discount for additional children. This is for a ten week course starting 13th January. Beginners: €40 for ten weeks starting 13th January. 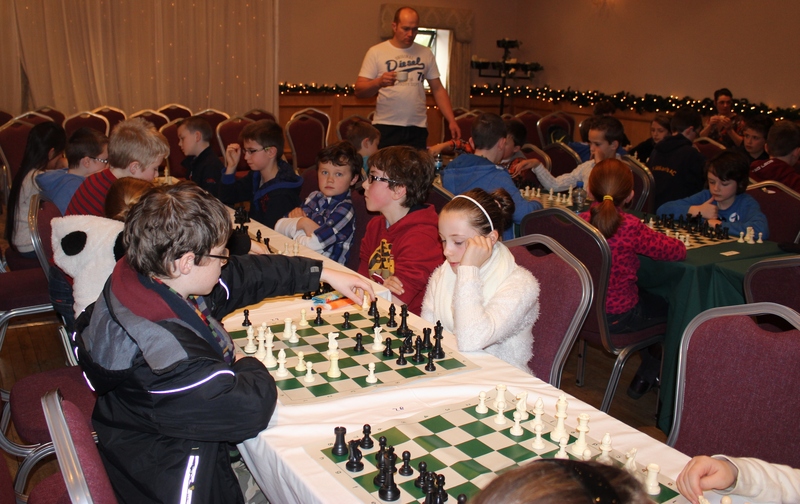 The next Wexford Chess Tournament for primary school children takes place at the Brandon House Hotel, New Ross on Feb 14, 2015. Registration at 10am. Prize-giving at 3.30pm. Fee of €10 includes lunch. Primary school children of all abilities are encouraged to attend. The craic is always great and, well the chess is usually pretty good too. Each player plays 7 games. Individual prizes in all age categories and overall individual prizes also. Best school prize (top 4 from each school to count). 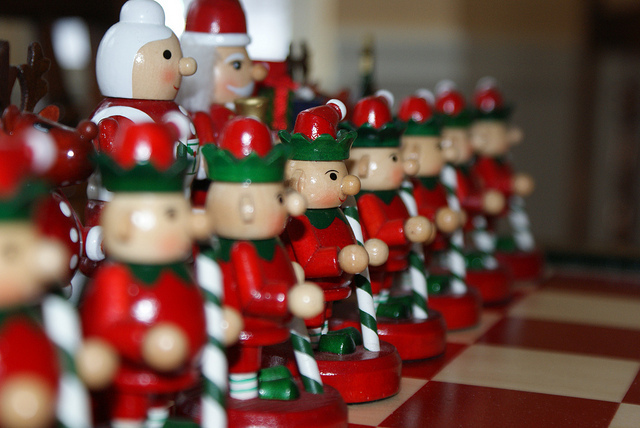 Ah Holidays – More Time for Chess! Enjoy the Christmas holidays folks. Remember to keep a chess board handy – I don’t want to see anyone coming back to us in January square-eyed and half brain-dead from too much tv! Nothing better than chess for giving your own internal CPU a work-out!! See you all again 8th January, 2015. The Annual Wexford Chess Tournament for primary school children takes place at the Brandon House Hotel, New Ross on Sat, Nov 29. Registration at 10am. Prize-giving at 3.30pm. Fee of €10 includes lunch. This is a great event which always attracts children, of all ages and all abilities, from throughout the county. Each player plays 7 games. Individual prizes in all age categories and overall individual prizes also. Best school prize (top 4 from each school to count). Don’t miss it! Enquiries: Seamus Halpenny 086 8585096. This is a wonderful little sketch of the wild, irreverent and sometimes aggressive chess scene in Washington Square Park, New York. Eamonn calls it a day! We wish Eamonn Barrett, recently retired Principle of Piercestown N.S., bagfuls of good wishes and kind thoughts. One presumes that this means he will have much more time to devote to chess now! Last night’s Chess Simultaneous event at the Talbot Hotel was a huge success. 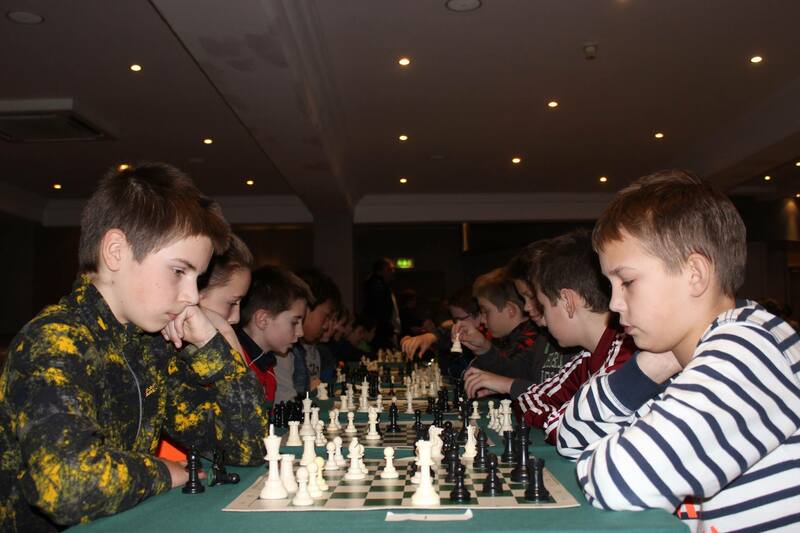 Two of the top chess players in the county, indeed the country, Manuel Gardenes and Miroslav Gallik, took on over twenty players of all ages and abilities. While the opponents fought valiantly and, in some cases, long into the night only one managed to secure a win. That honour went to young Joshua Redmond from Enniscorthy Chess Club who won out over Miroslav. Needless to say Miroslav was full of praise for Joshua afterwards as he presented him with the Best Young Player award. The other young player award went to Adam Copeland. A small number of players managed draws against Manuel and Miroslav. Relaxing over a welcome cuppa afterwards the exhausted duo were full of praise for the general standard of play especially from some of the younger players, including that of the aforementioned Joshua and Adam but also former Mercy School girl Aine O’Leary (below). 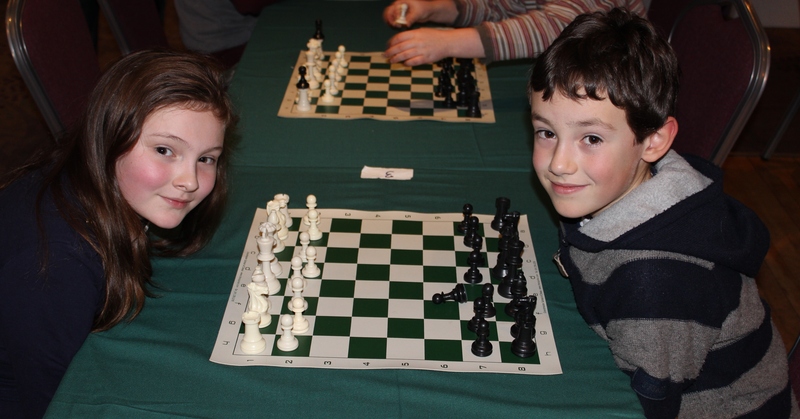 They both agreed that such events are very good and worthwhile ways of nurturing and developing chess and they encourage Co Wexford Chess to get behind any plans for similar events around the county in the future. The two senior player awards went to Gennadiy Galushchenko and Eddie Humphrey. Hats off to event organiser Paul Tierney for pulling it together. Paul (a renaissance man if ever there was one!) is a member of Gorey Chess Club. How time flies! We are now in our fourth week back at school and well and truly back into our old routine. Our Thursday after-school sessions are going really well with weekly numbers coming in at 20-24. It has all being very relaxed up to now with most simply happy to get their brains back up to speed following a chess-free Summer! 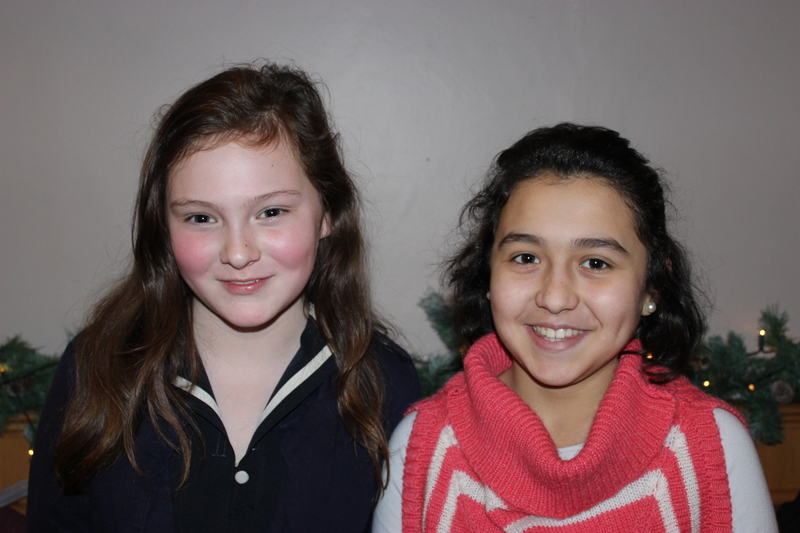 We extend a very warm welcome to our Spanish visitors Marta, …. By the end of first term everyone will have a firm grasp of the basics of the game of chess. You will understand the aim of the game, the value and strengths of each piece, basic openings, pawn promotion, the concepts of touch move, castling and en passant, the importance of looking ahead, the difference between stalemate and checkmate, and so on. We will also focus on the importance of etiquette – very important in the game of chess. Having said all that we will try to keep the vibe relaxed and fun. After all it’s only a game! Well the Easter holidays have flown by, chocolate stores have been hugely depleted and, well it’s starting to feel like Summer has arrived. Hard to believe that in not too many weeks Summer hols will be here. And chess will be forgotten about, a least until the Autumn! In the time remaining to us before we break we will try have a bit of fun at our weekly chess sessions. We especially want to ensure that the 6th class members leave with happy memories and, hopefully, that they continue to have an opportunity to play the game. See everybody on Thursday next at usual time of 2.45pm. 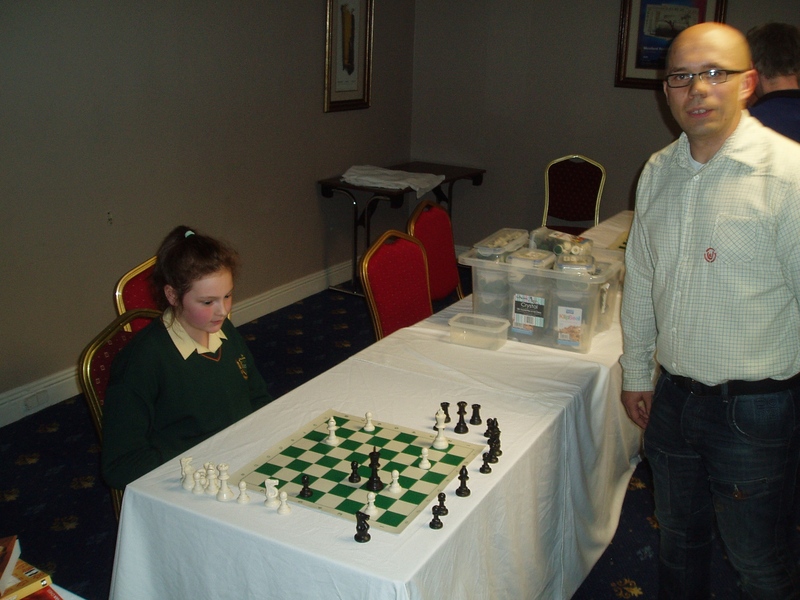 Meet a Grandmaster in Enniscorthy! Thanks to Piercestown National School for laying out the red carpet for us today as we played our annual “Spring Friendly”. It was the usual relaxed occasion with competitive instincts very much taking a back seat. We look forward to welcoming Piercestown in for a return match in the next couple of weeks. The Mercy School will be heading out to Piercestown National School on Thursday, Feb 27 for the annual “friendly” chess gathering. It is always a very enjoyable day with as much emphasis on craic as on competition. We hope to have a big contingent travelling this year with all classes from 2nd to 6th representated. The suggestion that the event be sponsored by Paganini ice cream has been taken on board! 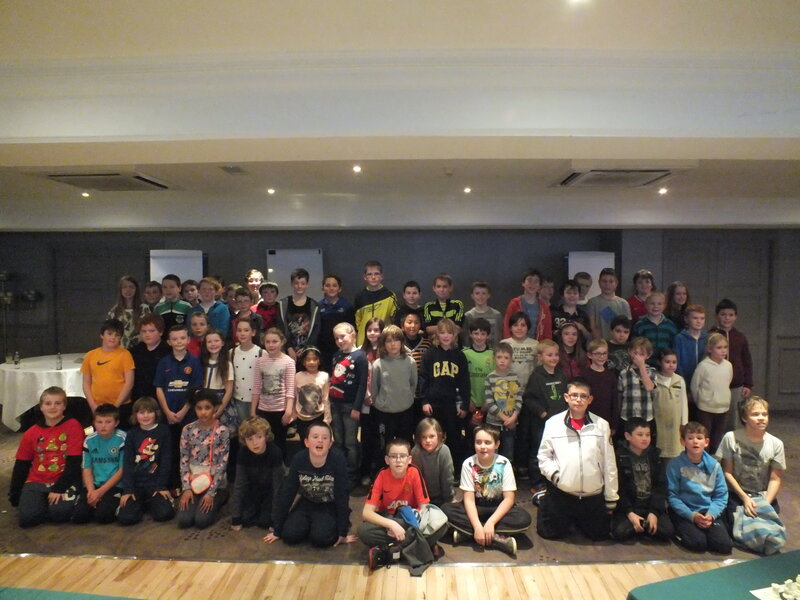 Children from throughout the county gathered at the Brandon House Hotel, New Ross last Saturday for the first primary schools chess event of the year. 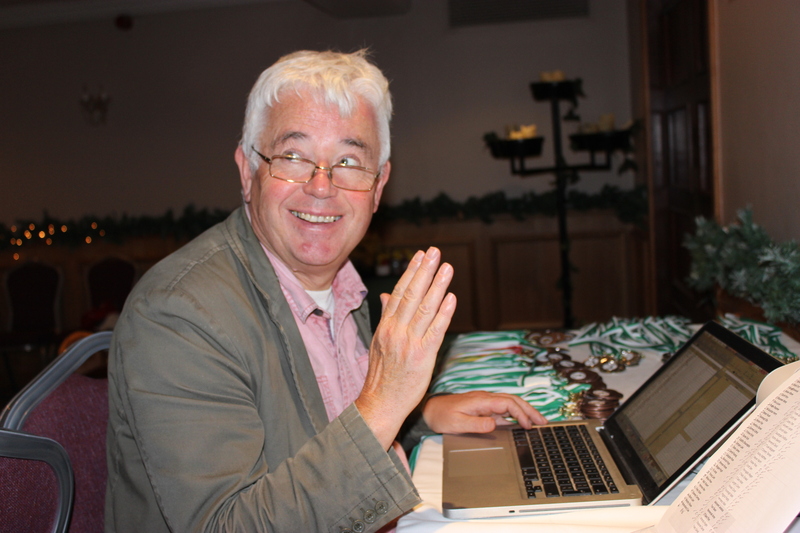 Event Director Eamonn Barrett was delighted with the large turnout of eighty five and with the high standard of play. He congratulated Gorey CBS on, yet again, winning the Best School Award. This was an individual, as opposed to a team, competition with each player playing seven games. As is standard in chess players get 1 for a win, 0.5 for a draw (or stalemate) and 0 for a loss. Overall winner was Patrick O’Connor of Gorey CBS on 7 points, followed by Niall Griffin of Piercestown N.S. (6.5) with Sean Callaghan, Gorey CBS (6) in third (all aged 12 years). Talented thirteen year old Vitaute Saudargaite, New Ross CBS, competing in the event for the final time, had another good tournament finishing with 6.5. The Mercy School’s Áine O’Leary finished joint 3rd in the under 13 category. Claudia Faraon won four of her seven games to finish on four points, while Sinéad O’Reilly scored three points. 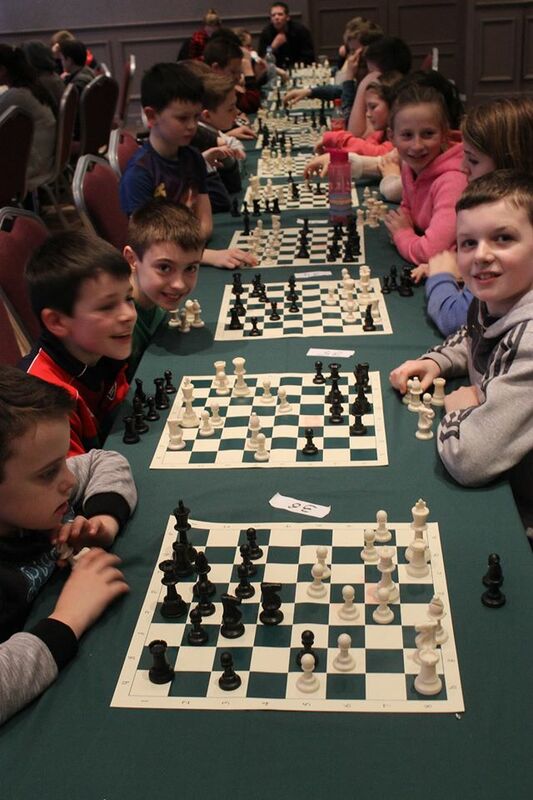 The annual Primary Schools Spring Chess Competition takes place on Saturday, February 8 at Brandon House Hotel, New Ross. The format will be the same as the competition at the same venue last December. Once again we say that this event is a must for chess playing children of primary school age throughout the county. The Mercy hope to have an even bigger squad than last time in attendance. We certainly have a number of girls able to mix it with the best in the county. While there is no denying that practise and regular playing is the best way to improve your game, it is just as important that one has the right attitude. Play with confidence and attack early – show who is boss! These events, competition aside, are very sociable affairs. Win. lose or draw we know you will make new friends. As in December, this is an individual, as opposed to a team, event. Registration takes place Saturday morning from 9.30-10.15am. Competition commences at 10.30am and ends with prize-giving around 3pm. A fee of €10 applies (includes lunch). 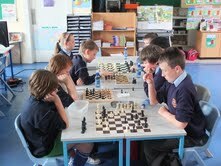 What a great day’s chess we had at yesterday’s Wexford Chess Primary School Competition in New Ross. Almost 100 children, ranging in age from 7 to 12, turned up to do battle, a cerebral battle of wits and guile featuring cunning openings, strategic middles and ruthless end-games! The standard was sky-high at the top end of the field with lots of sustained smart play. In general the competitive environment led to a raising of standards at all levels. Are we witnessing something of a chess revolution in Wexford! The overall winner was 12 year old Vaitaute Saudargas (New Ross CBS) on 6.5 out a possible 7 points; 2nd was Dylan Foley (8) from Clonegal; in third was Michael Kennedy (12) of Gorey CBS. Best overall school was Gorey CBS. The girls from the Mercy had a good day: Áine O’Leary was joint third in the U-13s, while Claudia Faraon was 4th in the U-12s and Sinéad O’Reilly was 5th U-9. 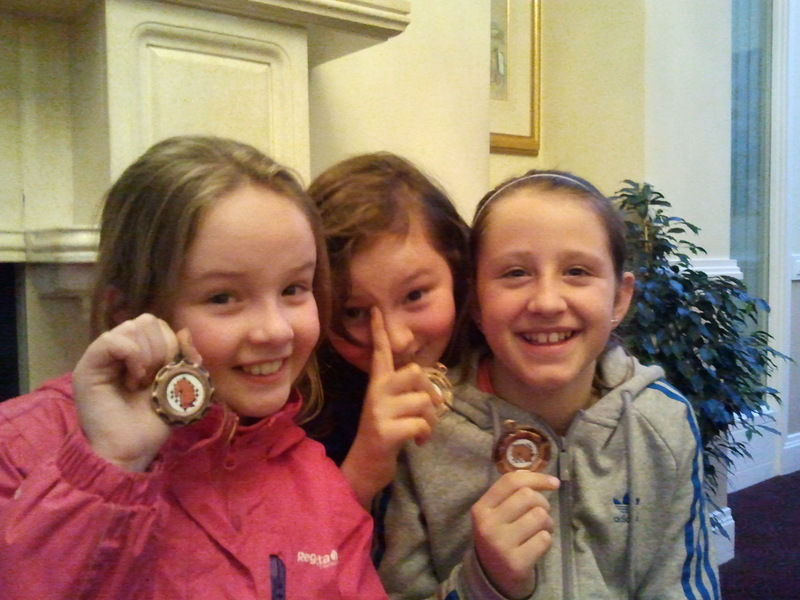 Well done also to Ella Kavanagh and Shona Cuddihy who were playing in their first chess competition. Well done to everyone who took part in this very worthwhile and enjoyable event. The fact that the day finished with an impromptu singing and comedic performance added, in no small way, to turning the whole thing into a social as much as a competitive success. 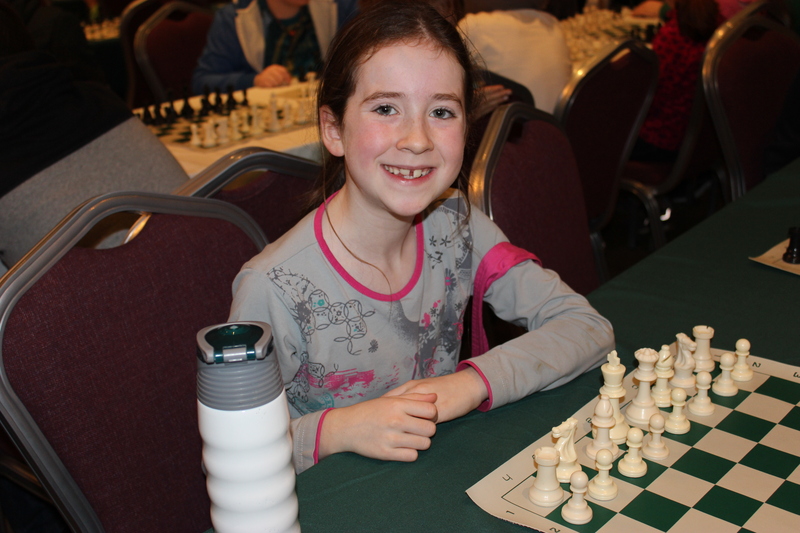 Speaking of which … take a bow Áine O’Leary – if you ever get fed up of chess you have a big future on Broadway! U-13: 1st Barry Kenny (Gorey CBS), 2nd Sean Callaghan (Gorey CBS), 3rd (joint) Sean Donovan (Our Ladies Island and Wexford Chess Club), Ciaran Fox (Crossabeg) and Áine O’Leary (Mercy, Wexford). U-12: 1st Andre McKiernan (Gorey CBS), 2nd Evan Byrne (Gorey CBS), 3rd John Hennessy (Piercestown). Claudia Faraon of Mercy, Wexford and Crossabeg’s Sadhbh Quinn were 1/2 point behind in joint 4th. U-11: 1st Lucas Stan (Rathangan, another regular at the Wexford Club), 2nd Ronan Griffin (Piercestown), 3rd (joint) Kelvin Perkin (New Ross CBS) and Rory Tubritt (Gorey CBS). U-10: 1st David Remenyik (Gorey ET), 2nd Ovidijius Saudargas (New Ross CBS), 3rd (joint) Ryan Callaghan (Gorey CBS), Adam Sinnott (Gorey ET), James Cleary (Gorey CBS). Wexford Chess member Matthew Molloy was just 1/2 point behind these. U-9: 1st Mark Hennessy (Piercestown), 2nd Cormac Downey (Gorey CBS), 3rd Andy Yu (Gorey CBS). Wexford Towns’ Mark Kavanagh and Sinead O’Reilly were 4th and 5th respectively. U-8: 1st Daniel Foley (Clonegal), 2nd Finn O’Gara (Gorey CBS), 3rd Angelo Miranda (Gorey CBS). U-7: 1st Daniel Stepanek (Michael St.). 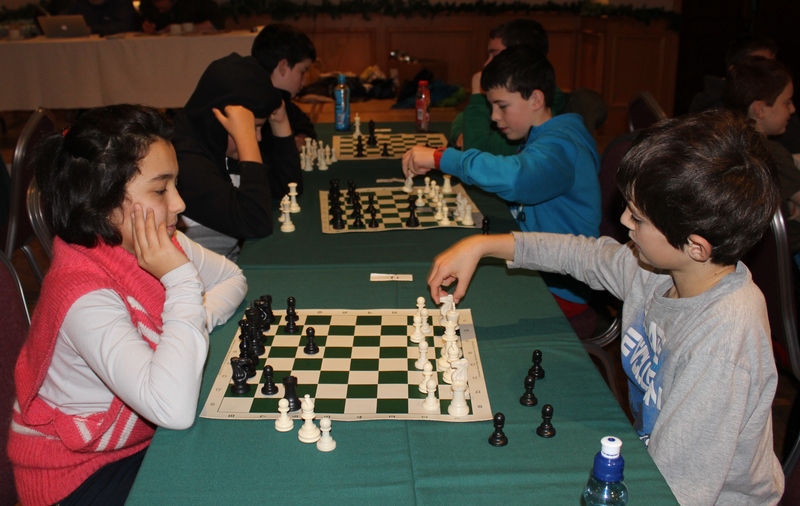 The annual Primary Schools Winter Chess Competition takes place on Saturday, December 7 at Brandon House Hotel, New Ross. 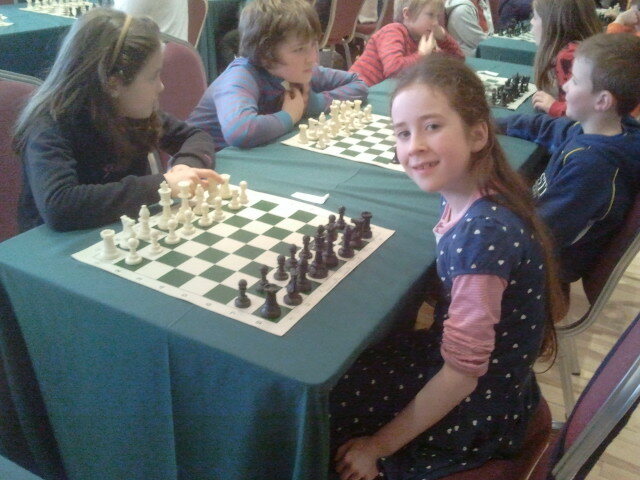 The Wexford Chess event is a must for chess playing children of primary school age. While the competition at the top of the field can be fierce this is also a very sociable day out – so whether you are grandmaster material or strictly a weekend player you will enjoy the day. This is an individual, as opposed to a team, event … so nobody will be leaning on you if you are playing below par! Registration takes place Saturday morning from 9.30-10am. Competition commences at 10.30am and ends with prize-giving around 3pm. Everyone should be on their way by 3.30pm. A fee of €10 applies – this includes lunch. Remember chess for children every Wednesday afternoon at Wexford Library (3.15-4pm for beginners and younger children, 4-5pm for those with some knowledge of the game and older children). It’s free and it’s fun! You get to play against children that may be better than you – great for developing your game. They usually have a qualified chess instructor, or at least a relatively highly ranked player, on hand for the second session. 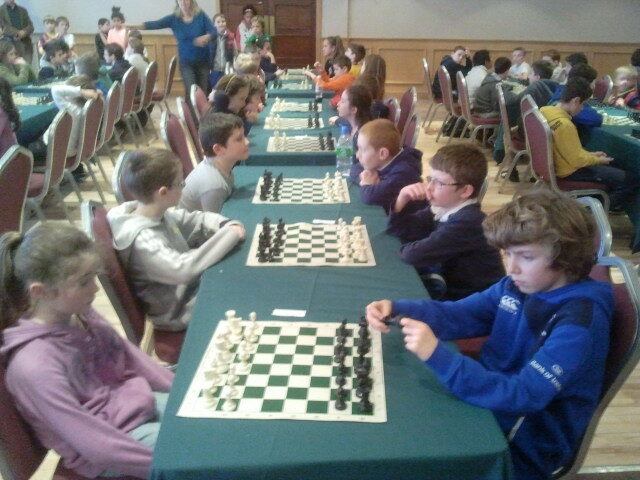 There is a chess competition for primary school children in the Brandon House Hotel, New Ross on Saturday, December 7. I have no other info as of now other than that it is an individual, as opposed to a team, event. Welcome back to another year of chess at The Mercy. We have a wonderfully vibrant club in place now with some very good players. And it is great to see so many new faces turning up to try their hand at this ancient game, this sport of Kings. We hope you stick with it. Why should you? Well you will be able to play against opponents from all over the planet (the rules are the same everywhere! 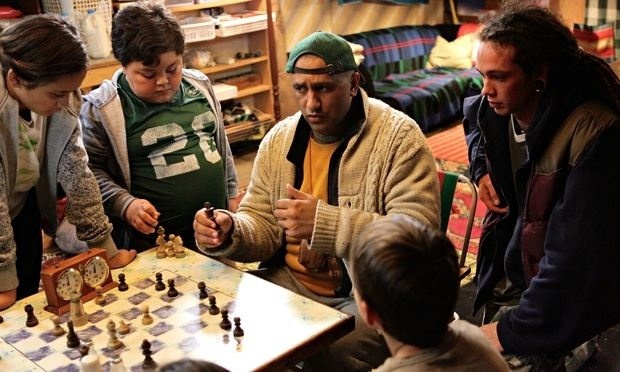 ); you should find that you are better at maths (chess encourages you to think logically); you will be able to beat your dad (how humiliating!). Our new internal league is now up and running – don’t worry if you find yourself making silly mistakes. It takes a while to get back into the swing of the game. We don’t know yet when the first of the inter-school competitions will take place. Hopefully we will have one before Christmas. In the meantime we will work at improving your game and getting you battle-ready! Hey, all you chess fiends, enjoy the Summer break and see you again in September. 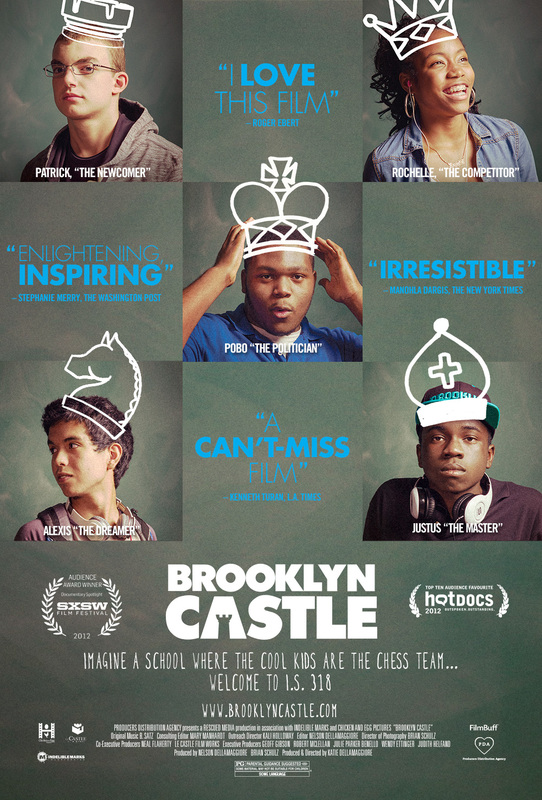 Note that chess at the library is also back in September. What’s that I see up ahead … oh yippee, it’s the Summer holidays! The school year has rounded the last bend and is now in the home straight. And that means we have only got a few more weeks of chess to go. Let’s finish with a bit of a sprint! We have an incomplete school league to deal with. New recruits and random defections over the past few months mean that we must juggle the teams around somewhat. We also have an outstanding invitation to go play the boys of CBS. We may have to do this one during school time as getting a sports-free after school slot is nigh on impossible now. While chess at school may be coming to an end it continues, every Wednesday, at Wexford Library. The under elevens session is at 3.15-4pm; the session for older children runs 4-5pm. The former session deals with the basics of the game and so is perfect for any child interested in learning the game. Last Thursday’s chess gathering at the Mercy School was a most enjoyable and amiable affair. Both Piercestown and CBS ended up with smaller numbers than planned as a result of various competing sports events getting in the way, something that is always going to happen at this time of year. Indeed, we were missing a few of our own squad. However, this did not, in any way, take from a great afternoon’s chess. The games were played in a very relaxed environment with older/more experienced players in one room and those at basic/intermediate level in another. All players got to play multiple games. The value of events such as this cannot be underestimated. Competitive instincts, concentration levels and strategic play all come into play in a way that does not happen at your regular practise session. We have seen big improvements in many of our girls not just over the past year but since we started three years ago (is it that long?). And I bet these same girls perform better in maths class now also! Two of those who have moved onto secondary school continue to play the game, meeting at the weekly children’s session in Wexford Library. They say it relaxes them! Thanks again to CBS and Piercestown for visiting us and for being such good sports. We look forward to renewing rivalries in the school year ahead (actually maybe sooner than that with CBS). On Thursday next we are delighted to welcome back C.B.S. and Piercestown N.S. for a chess “friendly”. Between the three schools there will be close to sixty children present. We will split into two groups: 2nd-4th classes and 4th-6th classes (some 4th-class children will be at a more advanced level than others). The emphasis will be on good quality and competitive chess in a relaxed environment with everyone getting at least three games. Hopefully we can prevail upon Mr G to raid the kitty and lay on some goodies for afterwards! 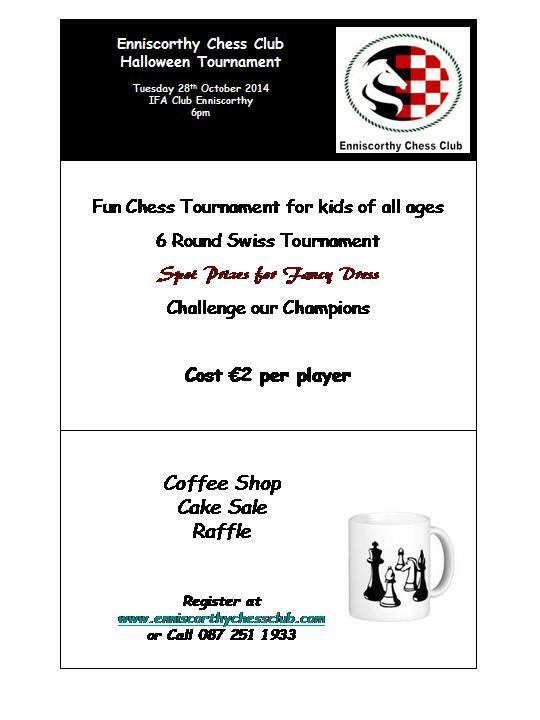 Enniscorthy Chess Club is holding a junior chess tournament in The Bailey Café/Bar, Enniscorthy on April 23. Registration is at 5.45pm, first game at 6.25pm. Prize-giving is at 8.30pm. Cost: €10. 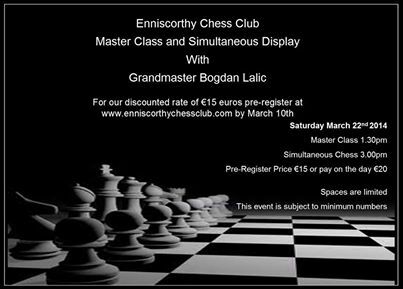 Email register@enniscorthychessclub.com. Tel 087 2511933. I have just noticed that I have not posted since we travelled to Piercestown for the “Primary Chess Challenge” earlier this month. What a great evening’s chess that was. There must have been close to 200 children there from schools all over the county. We had one senior team and one junior team (six per team). All twelve played their socks off and gave it their best shot. While we came away with a handful of wins and draws we did not make it onto the podium. What will it take to get up there among the medals? More game practise, more tuition … and more competitions like this! The Easter holidays are upon us now (HURRAH!) and, while school bags may be gathering dust in the corner, let’s make sure that the chess board gets daily use. When we return in April we will have our experts in for a number of learning sessions. We will also be inviting Piercestown in for another friendly event. Then, of course, there is our own school league which we need to complete before we break for Summer. 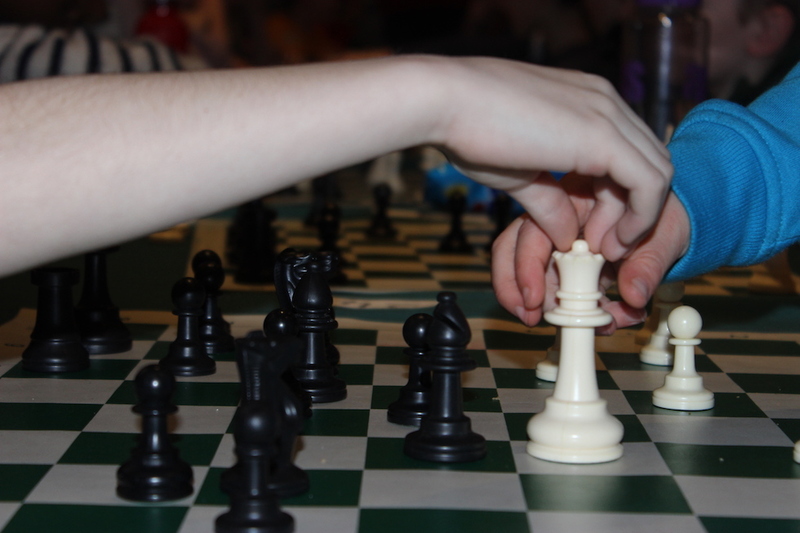 Piercestown National School hosts the annual “Primary Chess Challenge” on Thursday, March 14, 2013. This is a team event for primary school children with six per team (don’t worry if you have not got enough for a team as your numbers will be made up from others in the same situation). There are two sections: Senior (fifth and sixth classes) and Junior (fourth class and under). Entry fee of €2 per player. Registration is at 6.30pm. Prize-giving takes place around 8.45pm. Each school must provide at least one supervisor and to bring along their own chess sets. If you do intend taking part the principal of Piercestown n.s., Eamonn Barrett, wants to hear from you by 3pm, Tuesday, March 12. Email ebarrett@iol.ie. Tel 053 9158854 / 087 2109638. Note: you don’t have to be super-fantastic to take part in this event. In fact if you have yet to take part in a chess competition this is probably a good place to start. Office open 9am - 2.30pm.